Out of stock since Saturday, 6 April 2019. Due back soon. 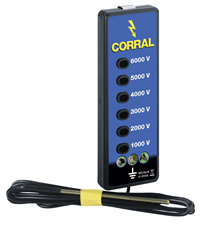 The Corral Fence Line Tester provides a six level voltage reading from 1000V to 6000V. It requires no batteries and gives the precise measurement of fence voltage. There are currently no questions for Corral Fence Line Tester - be the first to ask one!